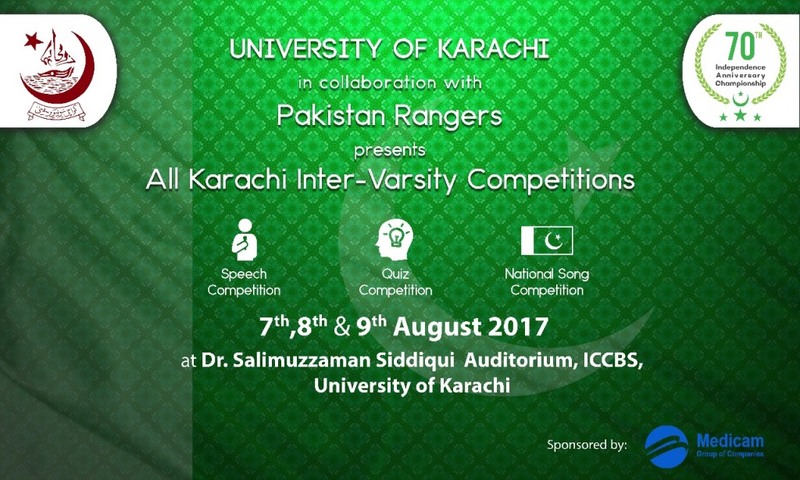 The University of Karachi is organizing an All Karachi Inter-Varsity Competition to mark the Independence Day Celebration. Three categories of competitions will be held on 7th, 8th and 9th of August 2017 at the University of Karachi. The initial rounds of competitions will be held on 7th and 8th of August. The final round will be held on 9th of August 2017. Vice Chancellors of participating Universities are likely to grace the event. 02 students for Debate Competition (1 for English and 1 for Urdu). Team of 02 students for Quiz Competition. Team of 03 students for National Song Competition. Nominations should reach the Office of the Student Advisor, University of Karachi on or before 2nd August 2017. Only internally shortlisted students will represent University of Karachi in the competition. The following students are nominated to participate in the All Karachi Inter-Universities Competition to be held at the University of Karachi on 7th, 8th and 9th of August 2017. -Only one team would be allowed from each University. -The maximum time for each speech is four and minimum three minute. -First bell will ring at three and half minute and the final bell will ring at fourth minute. -The mic would be turned off if any speaker exceeds 15 seconds from the given limit. -Paper Reading is strictly prohibited. -Speaker should only address the chair. -Offensive remarks against any well-known personality are also not allowed and will result in disqualification of participant. -Decision of judges would be final and non-negotiable. -The teams will be selected on merit, after initial selection. -The competition will consist on two rounds, First round on 7th and final on 9th of August. -This clot of blood shall thrive again. -One dream, one vision, one mission and one nation. -No power on earth can undo Pakistan. Theme of the Quiz is Pakistan. Preliminary round will be held on 7th August, 2017 at 10:30 am. Final round of the selected teams will be held on 9th August, 2017 (timing will be announced later). A team shall consist of max. TWO students. The participant shall not be allowed to use mobile or other electronic device. The question shall be in the form of multiple choice, True/False statement, specific-answer question, etc. Audience shall not give any hint or clues to the competitors.